We are excited to share with you that the Covington Fuzz Run Committee announced SteelCo Buildings, Inc. as the first sponsor of the year and the first ever “Diamond sponsor”. SteelCo was welcomed and honored as a supporter on January 18, 2018 in front of the Covington Police Department. The Covington Fuzz Run is an annual event which takes place in Covington, Georgia. They are expecting over 3,000 participants! Making this event one of Covington’s largest. There will be a 5K race and one mile fun run. The event benefits The Covington Police Who Care Foundation. SteelCo Buildings is proud to help the foundation as a way to raise money for officers who were injured or families of officers killed in the line of duty. 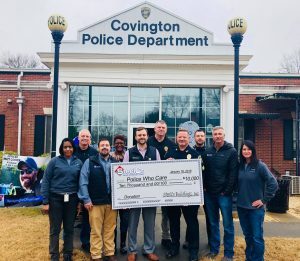 Voted the best race in Georgia for four years, The Covington Police Department’s 36th annual Fuzz Run is Saturday, September 14th, 2019. See beautiful homes, and the covington square from a new perspective. Participants can register online, now. See answers to a list of questions about The Covington Fuzz Run. The race will be moved in 2019 to start at Legion Field on Mill Street. When is the Fuzz Fun? Race day is Saturday, September 14th, 2019. What is the race rate? You can see a map of the race route here. Run though gorgeous historic Covington, Georgia with thousands of other runners and supporters of the Covington Police Department. Who does the race benefit? Race proceeds are presented to Covington Police Who Care. Register online on The Covington Fuzz Run website. Do you want to know more about the services we offer? Contact SteelCo Buildings, Inc. for more information about steel metal building kits.